Ahead of coach Greg Carvel’s formal introduction as head coach of Massachusetts hockey I’ve been taking a look at some numbers, as I tend to do. The story of UMass’ struggles in recent years was easily told through their statistics. So let’s take a look at the Saint Lawrence Saints’ team statistics from Carvel’s four years in Canton and see what’s to learn from them. The state of the Massachusetts hockey program has fallen on such hard times in recent years that some have said it will take an act of God to turn the program around. Well athletic director Ryan Bamford has chosen a Saint to elevate UMass hockey to the promised land that has mostly eluded the program in its history. Today Bamford announced that Saint Lawrence head coach Greg Carvel is the new coach of Minuteman hockey, signing a five-year deal to oversee the program. Tonight was spent at the UMass Club in downtown Boston surrounded by diehard UMass supporters gathered to meet new Massachusetts hockey coach John Micheletto as well as hear from hoops coach Derek Kellogg who is going into a season with some high expectations, deservedly so. Overall I thought it was an excellent event put on by the UMass Club and Alumni Association (and not only because it featured by far the best beer selection of the many of events I’ve attended there previously). There were easily over a hundred people there to listen to the two coaches and the hockey-type crowd featured Pond Club leadership, current Section Uers, original Section Uers, parents of current players, and overall a lot of familiar faces. I was impressed with Coach Mick in the time I had a chance to talk to him. Juxtaposed with the always boisterous Kellogg, he brought a more moderated approach to his remarks to the crowd. But overall I thought he had a composed, almost professor-like demeanor that helped showcase his knowledge of the game itself. What stood out most in my conversation with him was his comments on practices. In most of the stories about his plans for UMass hockey and approach to the game we’ve read a lot about an “up tempo” style. Previously I thought that was describing his offensive philosophy, but Coach Mick relayed that it goes beyond that. It sounds like his whole practices to date have been entirely up tempo. Not only are the players practicing what could be a more aggressive style, but they’re constantly going during the entire allotted time of practice. Coach Mick said he’s not going to use practice time to have 15 minute whiteboard sessions. The players will be on the ice practicing, skating, going through drills, etc.. I found that very interesting. He said that, after initial surprise, the players have really embraced that approach to practice, something I’ve heard from other sources as well. Other than that there wasn’t too much to glean from tonight’s remarks. He did say he is familiar with the reputation of UMass’ student section, with his own memories of such going back to way back when the visitor section was actually where UMass’ home bench now. I did take the chance to ask him what so many of you readers have asked me. And no, so far no captains have been named. I’m guessing he wants to wait until after this weekend’s scrimmage and truly get a read for who are the leaders of the team both in the locker room and on the ice. Other than it was enjoyable to be able to talk about the upcoming UMass hockey season with others who are as interested as I am. October has kind of snuck up on me as other aspect of life (read: work) have kept me extremely busy. But tonight was a good chance to restart the hockey engine before this Saturday’s scrimmage. The other major news to relay is that I have been able to confirm that former Boston College recruit Frank Vatrano is in fact interested in playing at UMass, something previously posted on USCHO fan forums and I believe also reported on USHR. It’s probably not a huge surprise that the Longmeadow native would want to play his college hockey close to home. 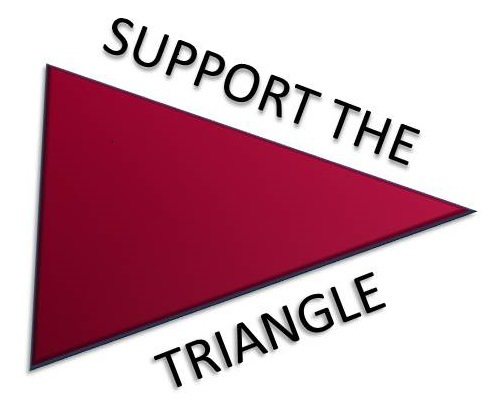 However, it’s important to keep in mind that given the NCAA clearinghouse issues that prevented him from playing at BC and just the odd circumstances in general, there are a number of major hurdles to clear before he could ever suit up for the Minutemen. I think it would also be important to vet out exactly what happened that prevented him from playing for BC in the first place. Make sure to read this excellent story on UMass fan favorite Kevin Moore out of his hometown paper in New Jersey. Moore has a tryout this month for Danbury of the Federal Hockey League and I’m sure I’m just one of many UMass fans who wish him luck in this next stage of his hockey career. So the word on the street is that former UMass coach Toot Cahoon will be employed in some way, shape, or form this current season as a color analyst for Merrimack hockey games, though I don’t know exactly in what capacity. Either way that’s a broadcast I’d love to tune in for. I’ll leave you tonight with the following picture. The ice is in. The lines are down. Let’s play hockey! 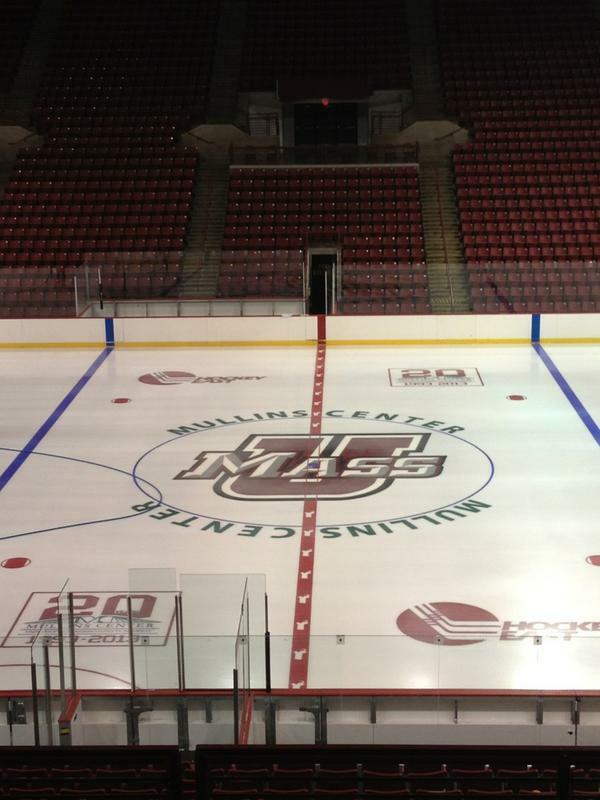 Note the new secondary logo at center ice, the Massachusetts state outlines in the red line, the maroon Hockey East logo, and 20th Anniversary logo for the Mullins Center (damn I feel old). I also like that this picture, taken by Associate AD Rocko DeLuca, is exactly opposite of my usual seat. Feels like home. Is it next Friday yet? There’s not too much going on in the world of UMass hockey these days, but here are a few links and stories that UMass fans may find interesting. San Jose Sharks General Manager Doug Wilson was specifically asked about Justin Braun and his role with the Sharks going forward and had some good things to say. Casey Wellman and the Houston Aeros are tied with the Binghamton Senators at 1 game apiece in the AHL Finals. Wellman has one goal so far in the series. Alex Kerfoot, a ‘94 who is being recruited by the UMass coaching staff, will play next season for the Coquitlam Express of the BCHL. Bruins GM Peter Chiarelli is actually going for his second cup of season. Shane Walsh and the Dubuque Fighting Saints, of which Chiarelli is a part owner, helped get him his first with the USHL’s Clark Cup. Toot Cahoon, energy resource analyst. Less than two weeks remain until the Pond Club Golf Outing. There’s still plenty of time to sign up to play. If you don’t or can’t play, you can always sponsor the tournament personally or through your business (or blog!) and still attend the cookout afterward and socialize with those associated with the hockey program. Click on the image to the right for more information. See you there! The UMass community is remembering Bob Paquette after he passed away over the weekend. A UMass alum, Bob built his radio career in the valley and will remembered by many as the host of Morning Edition on WFCR public radio. He also was very active around UMass, from speaking at commencement to doing PA duties at hockey during those early triangle-era seasons.